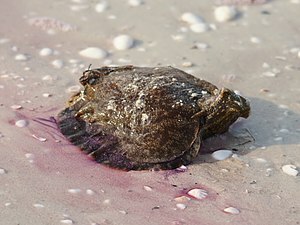 It’s a slippery blob that can be dark purple or yellow-green, depending on the type, and it might be washed up on just about any Florida shoreline. The sea hare lives in shallow water in sea grass. Like so much marine life, it can be found washed up on shore after a storm. They will release a purple ink (like in this photo) when stressed. An interesting fact about the sea hare is that they eat blue-green algae which sometimes contaminates water. I’ve read about a number of creatures that help our environment by doing this.